Hydroclimatologist John Lenters got his start working with lake observing systems as a postdoctoral researcher with the University of Wisconsin-Madison in 1996. Today, Lenters is an associate professor with the University of Nebraska-Lincoln and an independent contractor with LimnoTech, Inc., in Ann Arbor, Mich. He’s helped set up monitoring stations on lakes across North America. Through spotty cell phone reception in Michigan’s Upper Peninsula on his drive back from a research site on Lake Superior, Lenters spoke with us about Great Lakes evaporation rates, losing instruments to polar bears and paddling a surfboard across hyper-saline lakes in Nebraska. Environmental Monitor: You’re on your way back from doing some work on your observing station on Granite Island in Lake Superior. What are you measuring there? John Lenters: We’re primarily interested in evaporation rates. Great Lakes water levels are impacted by precipitation, runoff, and evaporation, and while precipitation and runoff are reasonably well measured over land, much less is known about over-lake precipitation and evaporation. Prior to 2008, we never actually had any direct measurements of evaporation over the Great Lakes. It’s been estimated through models since about 1948, but especially now with Lake Michigan-Huron having recently hit record low levels, everybody’s concerned about the impacts of climate change on ice cover, water temperatures, and evaporation, as well as what that all means for future lake levels. I was fortunate enough to get in touch with the owner of Granite Island back in 2007. It’s privately owned by a fellow from Marquette, Michigan, and his wife. They’ve made the island available for philanthropic purposes in the past, such as research projects, lighthouse enthusiasts, and other interest groups. So he was very open to the idea. We installed the monitoring station in the summer of 2009, and it’s basically a weather station on steroids. 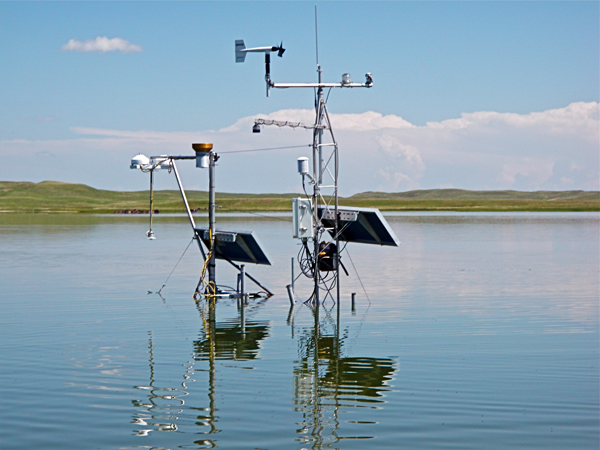 It starts out with very basic instruments that measure a lot of regular meteorological variables, and then we’ve got precision radiometers to measure the energy balance of the lake. The most important part is an eddy covariance system that measures wind speed and vapor pressure at a sampling frequency of 10 hertz. 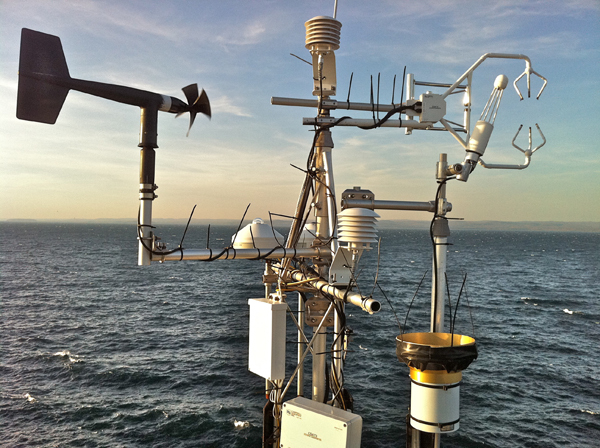 So every tenth of a second, we get detailed measurements of water vapor, wind speed and CO2. In total, we’re measuring fluxes of heat, carbon dioxide, and water vapor, which gives us an accurate estimate of evaporation out on the lake some distance from the island. Our goal is to basically develop a Great Lakes evaporation network and to make the data available for research projects and operational forecasting of Great Lakes water levels. It’s grown from one or two stations to now 6 or 7, including quite a number of investigators from Canada and the U.S.
EM: You also have a project setting up observing stations in lakes across Arctic Alaska. What’s going on up there? JL: Up there, it’s a very different system. As the permafrost thaws, the ice-rich sediments form depressions, and they fill with water. You get ponds, basically. They’re pretty shallow, but they occupy a large fraction of the land area. The landscape up there is 40 percent covered by either lakes or drained thaw-lake basins. So they’re a pretty dominant part of the landscape. We just recently received funding to start a National Science Foundation-funded Arctic Observing Network focused on lakes. The AON program previously didn’t have any groups studying lakes in the Arctic, and so we proposed to establish a lake monitoring network for the Arctic. We’re calling it CALON, which refers to the Circumarctic Lakes Observation Network. The goal is to establish an observation network in northern Alaska and use that as our test bed. With additional funding in future years, we would then expand that to include lakes in northern Canada, Siberia and elsewhere in the Arctic. EM: Is it a difficult place to work? JL: It’s a challenging environment to work in because the weather conditions are often quite bad. It’s remote, so you have to get to your sites by snowmachine, helicopter, or float plane. The helicopter and float plane are highly dependent on weather conditions. Sometimes you simply can’t fly, so you can’t access your sites. We’ve had stations that were demolished by polar bears, wires chewed up by Arctic foxes, and buoys destroyed by high winds and mobile lake ice. EM: Is it the most difficult place you’ve worked? JL: One of my more challenging sites has been in western Nebraska. This is a semi-arid part of the country, which makes it somewhat ironic that there are lakes, but they’re groundwater fed. It’s in the Sandhills region, and the rain that lands on the sand immediately infiltrates into the soil. Eventually, the groundwater seeps into the wetlands of the low-lying areas, and you get these lakes that then evaporate very rapidly. It’s the highest evaporation rate of any of the lakes that we’ve measured. Since most of these lakes have no stream outlet, all the salts are left behind during the evaporation process, so you get these hyper-saline lakes in the Sandhills region of western Nebraska. The primary lake that we’re studying has salinity levels that are two to three times that of sea water. The water is not only salty; it’s also alkaline. So it easily eats away at the seals of the small raft that we had out there, so the raft sank. But it’s a shallow lake, so the instruments stayed above the water. In terms of accessing data from the site, there’s no cell coverage, it’s a muddy lake, hard to get out to, and it’s usually very shallow. We wear waders and have often had to take a small surfboard to paddle out to the station. Somewhat surprisingly, the landscape looks amazingly like Alaska. When we go from this hot, dry environment in western Nebraska up to northern Alaska, it’s very different in terms of its climate, but strikingly similar in terms of the overall landscape and shallow lakes. I’ll even use pictures of these two sites in presentations to quiz the audience on which landscape is Alaska and which one is Nebraska. They often stare at it for quite a while before answering, and sometimes they guess wrong – until I show them a picture of a cow or a caribou on top of each of the two landscapes. If it wasn’t for the different flora and fauna, you’d hardly know the difference.